The global commercial avionics systems market displays a highly competitive and extremely consolidated landscape, finds a new research report by Transparency Market Research (TMR). Led by only a few participants, the market is likely to remain competitive over the next few years. The top four players, namely, Rockwell Collins, Thales Group, Honeywell Aerospace, and Garmin Ltd., accounted for a share of more than 77% in 2015. To match up the increasing demand for avionics systems, fueled by the rise in air travels, these players are anticipated to speed up their development rate over the next few years, states the research report. 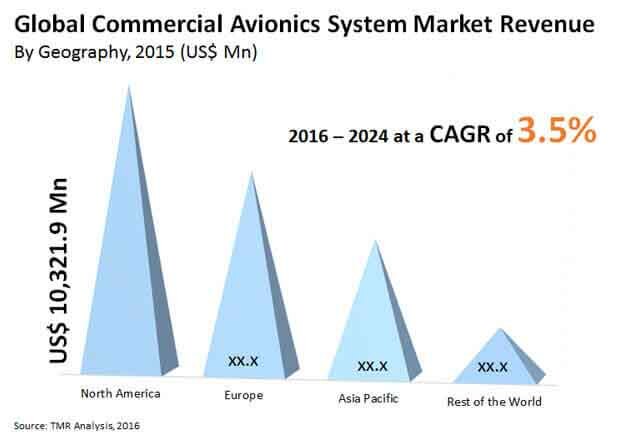 According to the research report, the global market for commercial avionics systems, which stood at US$25.34 bn in 2016, is anticipated to increase at a CAGR of 3.50% during the period from 2016 to 2024 and reach US$31.07 bn by the end of the forecast period. Cabin systems, cockpit systems, surveillance systems, avionics full duplex switched ethernet, integrated modular avionics, navigation systems, communication systems, flight control and emergency systems, electrical systems, and central maintenance systems have been considered as the main commercial avionics systems available across the world in this research report. As per the study, the demand for navigation systems is higher than other systems and the trend is likely to remain so over the forecast period. The report further evaluates the worldwide market for commercial avionics systems on the basis of geography. The market boasts of its presence across Europe, North America, Asia Pacific, and the Rest of the World, states the research study. With a share of 42.2%, North America led the global market in 2015 and was closely followed by Europe. Researchers expect these regional markets to remain so over the next few years, thanks to the early adoption of technology and strengthening of economy. “The global commercial avionics systems market is gaining significant impetus from the increasing technological advancements in the aviation industry,” says a TMR analyst. The rising uptake of glass cockpit and the continual advancements in in-flight entertainment are boosting the demand for avionics systems, which is anticipated to propel this market substantially in the near future. Apart from this, the growing emphasis on the technical upgradation of older ground and air systems is also projected to drive the growth in this market over the forecast period. However, the reluctance of clients in uptaking modern systems, caused by the high risk of cyber-attacks may restrict this market from growing smoothly, states the reserch report.